Review from a new contributor, please welcome Damien alias Mr. Omen from the USA ! Enter an audio vortex while you turn on, tune in, and drop out. Make sure you fasten your seatbelt, as we go for a ride on the FB69 time capsule. 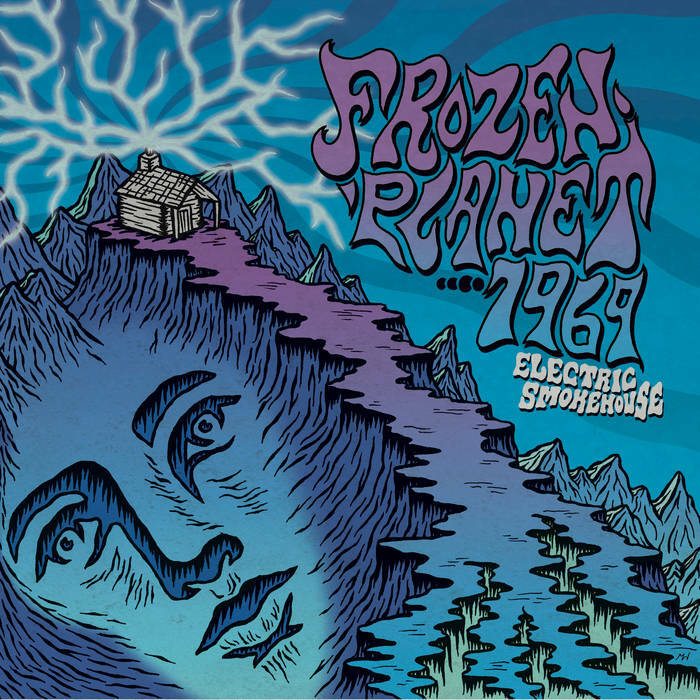 Electric Smokehouse is the fourth album by Frozen Planet…. 1969 and it’s composed of an improvised sound that will trip out the world you live in. I imagined this instrumental trio from Australia going on a space truckin’ high drive before a jam session, while they lugged around a portable record player. My ears envisioned them spinning fuzzy, psyched-out records. Grooving to their interstellar zone, they find themselves in the studio with flashbacks of being caught in-between dimensions of then and now; recording and experimenting — long-lasting, space jammin’ pieces. Paul Attard is fearless on his guitar. Rippin’ and wheelin’ as he remembers and discovers everything between his fingers on the strings, pedals beneath his feet, and all electric vibration. Frank Attard straight up owns the bass! Thick, heavy, fuzzed out, rhythm (and lead) that welcomes all into doom consciousness. Lachlan Paine synergistically completes the time traveling trio, with boogie and finesse. He brings a healthy mix of simple, straight-ahead into earth hypnotic beats. Ascendant, the first song blasts off, paying homage to stoner space jams. Right away, they’re letting us know they communicate through sound. Supersaturation continues a mind manifestation outside the galaxy, or maybe into the 1960’s. The three of them decide to formlessly intertwine themselves through time and space. Shores of Oblivion is almost a love song for all beings, everywhere, inside the universe. Mystical, bending, stoner riffs, slowly drip and melt away the thoughts of your day. Sonic Egg Factory orbits your skull into pulsing madness of the days when lighting on fire and smashing instruments was ritual for those who were possessed. The FB69 nostalgic frozen time capsule slingshots around the moon and heads home for landing. Pretty Blown Fuse is just that. The soundtrack journey experimentally thaws us softly into our defrosted cushion; reminding us life is once upon a time. It’s an improvising and experimenting journey of fuzzy, psyched-out long-lasting tracks. There’s more than one way to skin a cat, and FB69 evokes knowledge that there are other mystical ways to turn on, tune in, and drop out! Going on a high drive. Sitting in front of a vintage audio sound machine that’s built for analog purity. Headphones on, pulling bong-hits, laying down somewhere, and melting. The Vinyl version of Electric Smokehouse is out on Headspin Records and is available in either black or transparent purple in a gatefold sleeve. There will be limited quantities available via the Pepper Shaker Records Bandcamp page. Monster Magnet, Earthless, Sungrazer, & Hendrix’s genius posthumous compilation album Nine to the Universe!